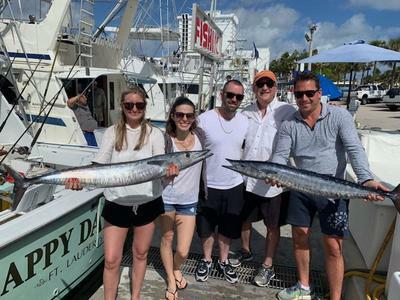 Friends, Melissa, John and Dave, from Belgium chartered the Top Shot Sportfishing charter boat team for a private deep sea charter boat sport fishing trip in Fort Lauderdale, FL. They were vacationing in Fort Lauderdale and decided to go on the fishing trip with the Top Shot Sportfishing charter boat team. Fifteen to twenty minutes after leaving the dock, lines were in 120 ft. of water at the sea buoy in Fort Lauderdale, 1.8 miles from shore. If you venture off another ¼ of a mile, you would find yourself in 500 ft. of water, which we, exclusively, have here in Fort Lauderdale due to Fort Lauderdale’s extreme drop off. The further north you go, the further the drop off swings off shore. We started trolling the reef with 4 surface Ballyhoo baits and two deep planner lines – one #8 planner with a blue and pink sea witch in front of a double hooked Bonita strip. The other with a #6 planner with a blue and silver sea witch in front of a double hooked Bonita strip on spider line. We started off trolling the reef line north of Fort Lauderdale, ranging from 80 ft. of water out to 200 ft. With a couple of swings and misses, we caught a Barracuda and a Bonita. From there I headed east of Fort Lauderdale and found a little rip with a color change in 400 ft. of water. We trolled to the south of Fort Lauderdale in search of some floating debris, but there was none to be found. Right planner rod! – as the planner tripped and line exited the reel. John was the angler and he reeled in a nice Wahoo. Our mate, Dave, gaffed the Wahoo and put it in the fish box. Nice going John! We reset and kept trolling the area south of Fort Lauderdale. The left planner rod tripped and the line exited the reel at a fast speed. The rod tip bounced up and down, which was a good indication that it was another Wahoo. The tug of war started – Dave was the angler and he reeled in the Wahoo. Our mate gaffed it, while being careful of the snapping sharp teeth, and put it in the fish box. . It was now time to head back to the dock. The anglers retired into the a/c salon and enjoyed the relaxing trip back to the dock at Bahia Bar Yachting Center, 801 Seabreeze Blvd. Fort Lauderdale 33316. At the dock, our mate filet out the fish for the anglers to enjoy that night for dinner.